I am an over-zealous carrot buyer. I buy far more than I need. Week in, week out, I never learn. So I’ve devised a few recipes for using up my root veg at the end of the week in ways that aren’t carrot cakes. Here I fry my carrots instead. For the bhajis, put the carrots, parsnips, gram flour, cumin, curry powder, ground coriander and salt into a large bowl and mix with your hands to release some of the moisture. Add the eggs and mix well. The mixture should be like a thick batter. Almost like an uncooked carrot cake batter. Fill a deep-fat fryer or a large, deep, heavy-bottomed pan two-thirds full with the oil. Heat to 150C (a drop of batter should sizzle and float to the top.) (CAUTION: Hot oil can be dangerous. Do not leave unattended.) Working in batches, drop heaped teaspoons of the batter into the oil and cook for 3–4 minutes, turning the bhajis all the time so they are an even golden colour. Drain on kitchen paper while you cook the rest. To make the chutney, put all of the ingredients into a food processor and blend into a smooth paste. 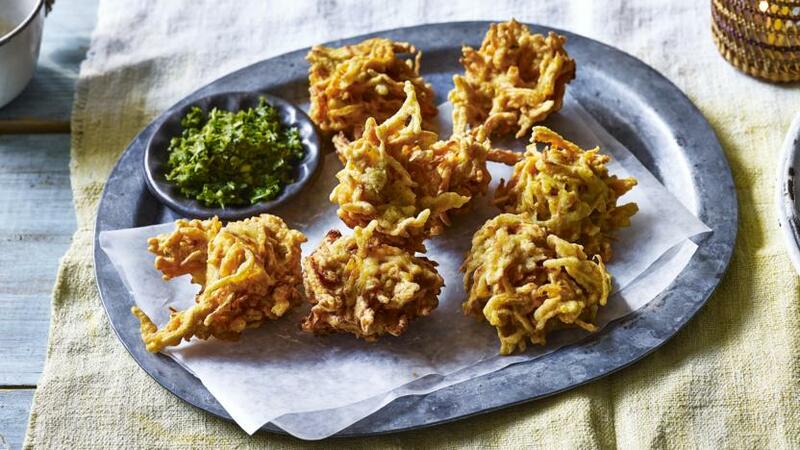 Serve with the bhajis. These can be cooled, placed in a ziplock bag and frozen. Reheat in a warm oven.